Standard Parking Corporation, the City’s parking enforcement contractor, is implementing some changes that will enhance the parking services the City provides. Beginning April 1, Standard Parking will begin using License Plate Recognition Technology to assist with ‘booting’, or immobilizing, vehicles with three or more outstanding parking tickets. Throughout the transition to Standard Parking Corporation, the City has been lenient in collecting fees for delinquent tickets. However, as Standard Parking continues to move forward with new parking services, the City is preparing to enforce fines for unpaid violations. Parking Enforcement Officers will operate vans with two cameras mounted on the roof to identify license plates of ‘scofflaw’ vehicles. Once the license plate information has been verified, an orange ‘boot’ will be attached to either the driver’s side front or rear wheel to immobilize the vehicle. Two notices will be placed on booted vehicles, on the driver’s side window and the windshield, with the full amount due, including a $60 processing fee for the boot. Before vehicles can be released all delinquent fines and subsequent fees must be paid in full. The boot will be removed within 45 minutes of the City receiving payment. 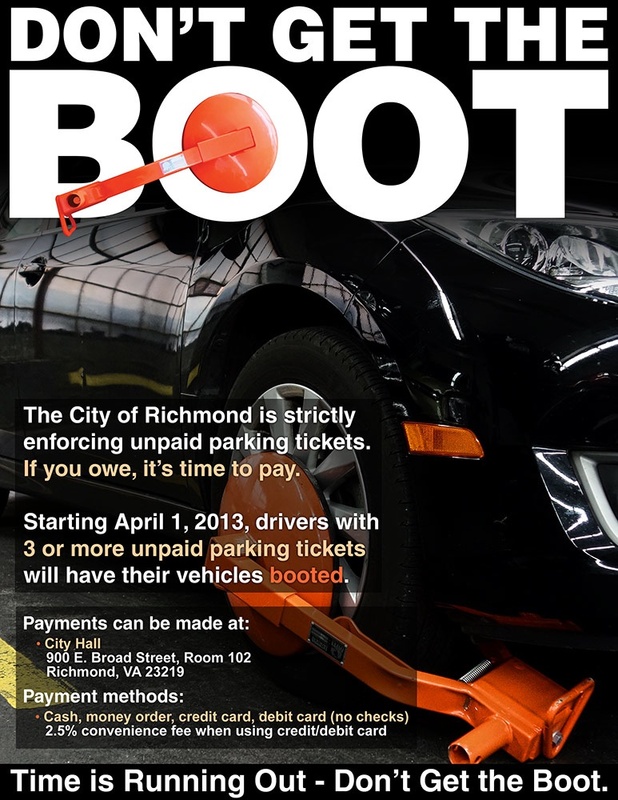 The City is encouraging residents to pay all unpaid parking tickets to avoid getting a boot on your vehicle. If your vehicle is booted for unpaid fines, tickets can be paid in the Finance Department on the first floor of City Hall with cash, credit card, debit card or money order. No checks will be accepted. There is a 2.5 percent convenience fee for debit or credit card payments. Leaders from the City of Richmond, Bon Secours Virginia Health System and the Washington Redskins, amongst others, will break ground on the Bon Secours Washington Redskins Training Center located at the Leigh Street (Science Museum) site on Thursday, Feb. 14 at 2 p.m.
Virginia Governor Bob McDonnell, Richmond Mayor Dwight C. Jones, Bon Secours Virginia Health System CEO Peter Bernard and Washington Redskins Executive Vice President/General Manager Bruce Allen, amongst other Richmond-based partners, are expected to attend. As the new home of the Redskins three week summer training camp beginning this year, the world-class training facility will bring an estimated $40 million investment to Richmond, in addition to hundreds of new jobs. The economic impact of the camp alone is estimated to be $8.5 million per year. When camp is not in session, the Bon Secours Washington Redskins Training Center’s playing fields and locker rooms will be made available to the public for youth programs and competitions. The training facility will also house Bon Secours Sports Medicine, rehabilitation services, men’s health, fitness and education programs and movin’ mania, Bon Secours’ Healthy Kids Initiative. Other Richmond-based firms instrumental with the construction, development and engineering of the Bon Secours Washington Redskins Training Center include Hourigan Construction, 3North and the Timmons Group, respectively. The Bon Secours Washington Redskins Training Center is expected to open doors for camp this summer and is expected to attract more than 100,000 fans. For more information on the Bon Secours Washington Redskins Training Center, visit www.redskinsrva.bonsecours.com. “As of today, I have accepted the resignation of Bryan Norwood from his post as Chief of Police for the city of Richmond. I am very thankful for the more than four years of dedicated service he has offered to our city and for the leadership that he has brought to the Richmond Police Department. I know that in many ways, the Richmond Police Department and our city is better off because of his involvement, his dedication, and his concern and care for our communities. But we’ve reached a mutual agreement in that his time as Richmond’s Police Chief has come to an end. “Today I am announcing the appointment of Ray J. Tarasovic as Police Chief. Effective tomorrow, this appointment places a new chief in charge who already knows our city; having previously served as Assistant Chief of Police in Richmond under former Chief Rodney Monroe. He has made Richmond his home since coming here to serve on the force in 2005. He is coming out of retirement to be in service to the City again. “Chief Tarasovic will bring a degree of professional leadership and knowledge that we need to move forward as our city grows and as we work to meet the challenges ahead. “He is a veteran officer who is highly qualified with a career in law enforcement spanning forty-one years. He possesses over 30 years of management and executive experience in the states of North Carolina, Virginia and the District of Columbia. Most recently he has been working in a consulting capacity with the Virginia Department of Criminal Justice Services and the Office of the State Secretary of Public Safety, Marla Decker. “During the years that Ray was Assistant Chief of Police here in Richmond, we experienced a 34% reduction in major crime and a 43% reduction in homicides; and I’m really looking for some strict attention to be paid to our homicide rate. Presently, we’ve got some work to do where our crime statistics are concerned; certainly we want to keep trending in a positive direction in those areas where we are doing well, and we want to improve in those areas that may have done a little back sliding. “I believe our community policing model has worked well over the last several years. This is a model that was first introduced to our city by former Police Chief Monroe; and we want to continue the good work being done with the faith community and with the young adult police commissioners -- both aspects of our community policing program – and others.